Facts and objective analysis are important, but for policy analysts to make a difference in the real world they also have to be able to tell a story, former U.S. Sen. Elizabeth Dole said Saturday. 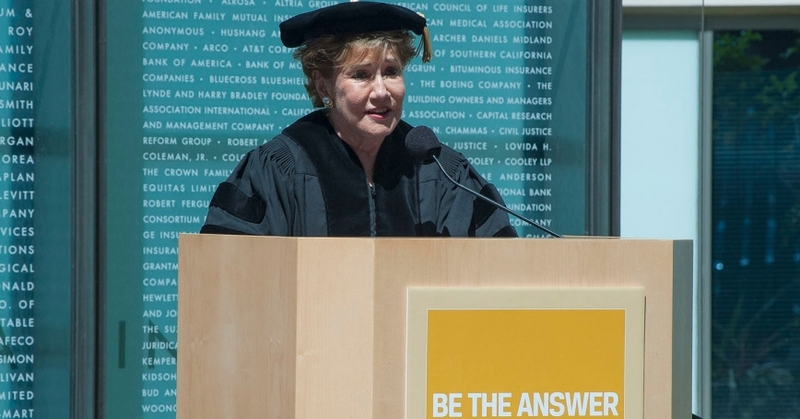 Dole, founder of the Elizabeth Dole Foundation, which is dedicated to helping “wounded warriors” and their families, was the featured speaker at the Pardee RAND Graduate School commencement at the RAND Corporation campus in Santa Monica. A total of 30 doctoral degrees in public policy analysis and 39 master's degrees were awarded during the ceremony, which was attended by more than 350 people. Dole's impressive career has included such positions as serving as secretary of transportation under former President Ronald Reagan, secretary of labor under former President George H.W. Bush, head of the American Red Cross and then North Carolina's first female U.S. senator from 2003 to 2009. “I believe with every fiber of my being that sound policy must be grounded in and guided by compelling research and keen analysis,” Dole said. “But I want you to discard any affection you may have for the notion that having done the analysis, the facts 'speak for themselves.' Instead, you will find that many people will either use or amend the facts as necessary to pursue a particular course of action. “And that sobering thought leads me to say that your ability to tell a story based on the facts is as essential as your ability to assemble the facts. The point of research and analysis is not simply to collect data, but to provide a basis for solutions. Dole cited a research project on military caregivers conducted by RAND and commissioned by the Elizabeth Dole Foundation as an example. The study presents convincing data laying out the evidence for why the nation must support its 5.5 million military caregivers, but it's also telling a story about those “hidden heroes” who provide care and support for wounded veterans. Dole also cited examples from her own career: as secretary of transportation, she focused on the “story of safety” to get legislation passed to raise the nationwide drinking age to 21, enact/encourage state safety belt laws and require airbags in all cars. She had plenty of evidence, but what convinced Reagan and automakers was the larger story that these measures would save lives. The Pardee RAND graduates have been exposed to both points of view — from using advanced data collection, statistics and economic modelling to dissect policies and programs to looking at society's largest challenges and taking the long view — and know both the power and limitations of both, Rich said. The “grandest view of all” for a policy analyst combines both views. 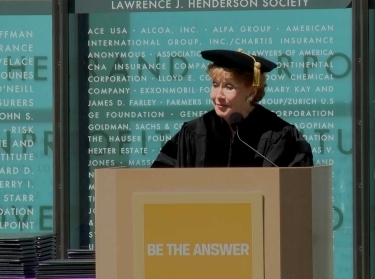 Susan L. Marquis, dean of the graduate school, said the graduates were now moving from a focus on learning to a focus on contributing to the world around them. “Take the tools, experience and education you've gained at the Pardee RAND Graduate School, and combine them with your talent, intelligence and heart to make a difference, to make the world a better place, to be the answer,” Marquis said. Honorary degrees were presented to Dole as well as to Los Angeles Police Chief Charles Beck; Joan Petersilia, the Adelbert H. Sweet Professor of Law and co-director of the Stanford Criminal Justice Center; and RAND alumnus and Nobel Laureate in economic sciences Lloyd Shapley. Shapley's award was accepted on his behalf by his son, Peter Shapley. Beck told the graduates that their work as policy analysts can help people in positions of authority like himself make sure that when they change people's lives, it's for the better. He noted that “there will rarely be an answer that is perfect in theory and achievable in practice,” and told them that their impact may be multiplied by enabling others to be the answer. The Ph.D. recipients are: Ruopeng An; Benjamin Paul Bryant; Jim Burgdorf; Stephanie Chan; Jack William Clift; Amber Lynn Didier; Jeremy Michael Didier; Kimberly Hale; Scott Charles Hiromoto; Eileen Rose Hlavka; Seo Yeon Hong; Matthew Amos Hoover; Steven Isley; David Richard Johnson; Lisa Klautzer; Sarah Kups; John Kenneth Langley; Christopher Jun-Heng Lau; Russell Peter Lundberg; Alessandro Malchiodi; Christopher McLaren; Tewodaj Mengistu; Kevin C. O'Neill; Kay Sullivan Faith; Jesse Aldous Sussell; Caroline Tassot; Bobby Theologis; Xiao Wang; Daniel Waxman; and Helen W. Wu. Among the faculty and fellow awards, Xiao Wang was given the Herbert Goldhamer Memorial Award; Ruopeng An was given the Glenn A. Gotz Award in Economic Analysis; Steven Isley was given the Gaylord K. Huth Memorial Award; Tewodaj Mengistu was given the Richard E. Sherwood Memorial Award; and Jeanne Ringel and Roland Sturm were given the Edwin E. Huddleson Jr. Outstanding Teacher Award for 2013 and 2014, respectively. With about 100 students, the Pardee RAND Graduate School is the nation's largest public policy Ph.D. program. Its 197 faculty members are drawn from the more than 1,000 researchers at RAND, a nonprofit research organization. Founded in 1970 as one of eight original graduate programs in public policy created to train future leaders in the public and private sectors in policy analysis, the school is the only program specializing in the doctorate degree and the only one based at a public policy research organization. For more information about the Pardee RAND Graduate School, visit www.prgs.edu.